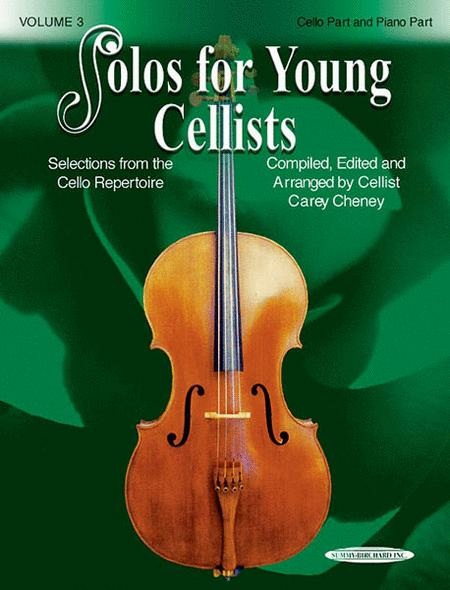 Selections from the Cello Repertoire. Arranged by Compiled, ed., and arr. Carey Cheney. String - Cello Studies or Collection; Suzuki. 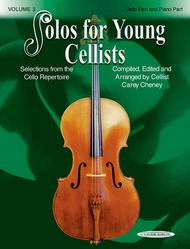 Solos for Young Cellists. Companion CD also available (see item 21890). Instrumental Solo Book and Piano Accompaniment Book. 108 pages. Alfred Music #00-21030X. Published by Alfred Music (AP.21030X). ISBN 1589512103. English. Compiled; ed. ; arr. Carey Cheney. Romance-Debussy * Bourree-Squire * Serenade Basque-Adorian * Sicilienne-Faure * Sonata in E Minor, Op. 38, No. 1-Romberg * Sonata in E Minor, Op. 38, No. 1-Romberg/Farrar (quartet arrangement) * Fond Recollections, Op. 64, No. 1-Popper * Harlequinade-Squire * Humoresque-Squire.